Amazingly, though certainly most welcome, I was able to find some gold on the very first test of the Bluedog unit in a stream with a fair amount of current. It is important to note that I live in Iowa, gold here is primarily glacial in origin and very fine...but it is there and even the Bluedog was able to easily capture it from below the large rock I was working. ……………… I was consistently finding black sands, garnet pieces, and other heavies. It even included some BB shot that must have washed downstream at some point in the past and a very nice piece of staurolite. The Bluedog was definitely picking up the heavies and holding onto them well! Dennis, I hope you are doing well. 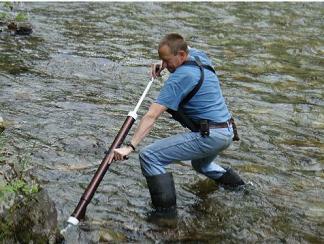 I've used the Fissureman II several times and enjoy using it. I used it today and found a few pickers here in Georgia. ......I recently found about 3 grams of wire gold. It is in a place called Liberty, Washington. The town is an old mining town that has produced for a century. It is not done yet! The locations to prospect are hard to find, the land is all claimed up, but there are still places within the creek that one can get to. A lot of the claims are dead anyway, people come out here, make a claim, and then realize it is hard work. My family has deep mining roots here, I have been prospecting my grandfathers old mines, they have been untouched for 50 years and work as natural sluice boxes on the mine floor. I am a self proclaimed 23 year old geology nut and came up with the theory that it had washed gold over the floor, your tools proved that. Problem is that it is very cold so I only worked 20ft of the 1400 foot shaft. And a power dredge is impossible to get to the entrance, thats why I asked about packing it before I bought. All I can say is wow already found all my money back in gold!!! The Gold-N-Rod + Sand Man was not what I was expecting..... It was way BETTER than expected !! !You really put a lot of R&D into a quality build of that stuff!! I can't wait to try it out !! 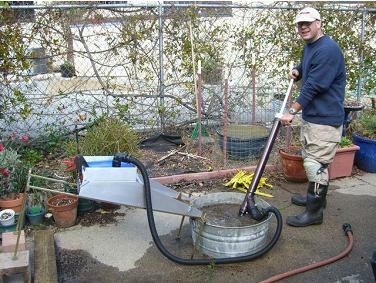 I wanted to experiment with your GOLD-N-ROD hand dredge and the SANDMAN attachment on my GrizzlySluice III from Bear Bottom Mining I found a lid from a detergent bucket that fit well over the top hopper when held in place with a clamp. I then drilled a hole in the lid to accept the SANDMAN hose. During testing I found the GOLD-N-ROD to be an awesome pump. 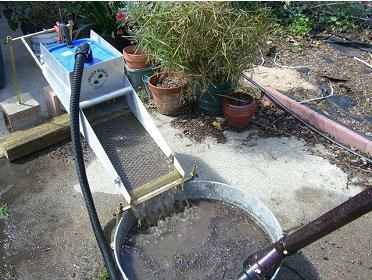 I had no problem keeping the Grizzly III fed with enough water/material slurry to the point where the material would move off the secondary expanded metal screen on the GrizzlyIII (This normally has it's own washing step where a bucket of water is dumped vigorously on the screen to clean it) . I then salted 14 pieces of lead that I painted red in about 2 quarts of sand that was placed in a full 20 gallon wash tub. I recovered 12 test nuggets in the sluice box, with one one real flat one that gotten trapped just before the carpet/riffle system but when I was cleaning out the carpet I washed it out by mistake and found it on the driveway with my metal detector. The next test piece of lead was found stuck in the wash tub weld/seam and it never made it into the GOLD-N-ROD. The last test piece of lead was found the next day rattling around in the pump assembly but had not been pumped into my sluice box yet. So that makes a 93% recovery with 100% of the test nuggets accounted for !!!! I till be taking the GOLD-N-ROD up to the Mother Lode this weekend and will report back with my findings knowing that it will be up to the task. PS: In the photos you will notice that the Grizzly III is on a recommended 12" slope to keep the top expanded metal screens level. Mark - Redwood City, CA. Thanks so much for the quick reply! Thanks for explaining the function of the flappers so clearly. I hope to get out and use the dredge again soon. By the way the dredge does work great! First time out I did recover a few specks of color. And that was only on a little better than one collection bucket! I just recieved the GoldSucker and sat there over an hour admiring the engineering craftsmanship in your item. It`s about the best built and engineered device I've seen on a lot of years. 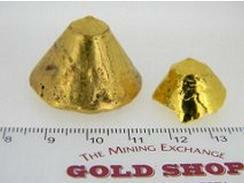 I`am a 68 yr. old electrician and have been prospecting here in Indiana for Glacial gold for a number of years. Real fine gold here but also found 4 small diamonds. I usually build my own equipment until I saw your device. I haven`t see such quality for the buck in years. I hope to retire soon to Dahlonega, Georgia, (The Gold Capital Of The East), and get a few acres on the Yahoola River. The river is the best producer on the whole East coast. In October I am going to Georgia for a week and will use the Fissureman exclusively with my Minelab detector. I will take some pictures and send them to you showing your Fissureman in action. 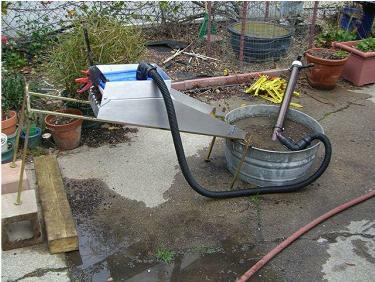 I am going to build a small sluce box to attach to the Fissureman instead of the bucket as I will be pumping a lot of water anyway. ........... Thanks for the great product. Maybe after I retire to Georgia I might sell your Fissureman products locally. 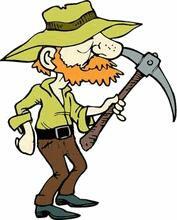 There is an unbelievable number of prospectors there what with Dahlonega being a major year- round tourist spot. Well, better go now. Will keep you posted. I used the bluedog with the sandman this past weekend for a few hours. Took awhile to figure out that it needed to be primed before it would make enough suction to get the material to the bucket. The river I was in has very course material so it would clog the hose to the bucket.But over all I think it worked very well and I was able to pull a couple of flakes out from under a water filled hole under a rock. I doubt I would have been able to get it with out the bluedog. Since I was by myself and the weather wasn't the best, I wasn't able to get any photos. Hopefully next year I can get some one to tag along and take a few for your web site. 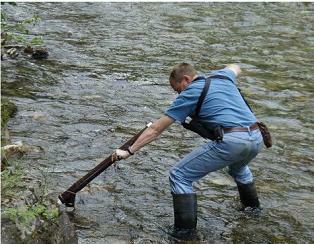 Here are a few pictures I took at the river using the blue dog. I wasn't able to use the small nozzle because there are just to many stones that would plug it up after just a few pumps. I switched back to the larger nozzle, and was able to fill the sandman in a few minutes, with the nozzle getting plugged much less. From the pictures you can see what I started with by the rock, and how I was able to remove material down and under this rock. Took about 3 to 4 hours to process that material. I would hand dredge, empty in to classifier, rinse, run through the sluice, then pan at the end of the day. 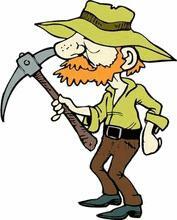 What I found was:About a dozen flakes and some flour gold, three nice piece's of pyrite, one pea size garnet, and one marble size red quartzThe last day I went visiting other prospectors on the river, and showing them the blue dog. I would dredge their works for a few minutes and dump it in their bucket. Later I checked with then, 8 in total and they said that they found at least two to three flakes in what I got for them. They really liked how I could get deep in wet holes and under rocks where they could not reach. You may get some orders from these people.They where from Maine,Vermont, Connecticut, and NH, they where all very impressed. Wish I had thought to make copies of your card. Its a great tool at any rate, thanks again and well try to stay in touch. BTW, your response was fast, short, clear, and exactly what I needed to know. I appreciate it. Yes, FYI, for your information, I immediately ordered the 36" w/o the 5x mag, and I did that partly due to your good customer service. Please feel free to pass on if you want. I was in management for 40 years before retiring...and as a manager, I always enjoyed...and NEEDED....feedback from actual customers.... So, don't be embarrassed, pass this on. If you're the owner, print it out and frame it. That way when you get a complaint or ornery customer, just remember you can't win them all. I also owned two businesses, besides being a manager for very large corps. I recently bought an underwater viewing scope and I wanted to let you know how happy I am with this product. I bought it for my wife as a surprise and she was thrilled. I was really impressed with how well made and how light weight it is. It's a fairly simple product, but there is clearly some good engineering going on here. I also wanted to say thanks for the fast and reasonable shipping. Everything about the transaction was first class! I love your ingot molds. Here are 2 that I poured today. They were melted and poured seperately as the small one is from a single goldfield and I want to check the assay at the shop tomorrow to see what it comes up as.The other is native gold and a few bits of 18K that the shop has bought and I poured to get ready to refine. You are welcome to use this image if you want. The larger one weighs in at 124.18 grams, the smaller one is 33.38 grams. Hey I just got my goldsucker BLUEDOG and I am just blown away by the quality of the unit! Thank You! I think you need to buy or borrow a High Definition camera and take new photo's of your stuff because the pictures by no means represents the absolute quality or workmanship. Did I mention your stuff is awesome yet? Hey Dennis how are you? So my order came in yesterday, 2 days ahead of schedule, wow. All I can say is thank you. I am totally impressed with the quality of these tools. Great as your videos and website are, they do not do justice to how remarkable these products actually are. The BlueDog is very strong, rigid and durable, exceeded all and any of my expectations. This is not some pieced together pvc contraption like so many others seem to be. The quality, time, r&d, totally comes across the moment you hold it in your hands. Even the extra nozzles are super tough. And the bayonet style attaching is simply genius. No chance of damaging or jamming threads, and increased support instead of a simply stick in. The mini man is unbelievable, and yet another expectation surpasser. Then there is the DLHD, again the pics and vids do not do it justice. The bellows pump is a very solid and tough rubber, it really is just great. I want to thank you again for all of your help before I even made a purchase. I feel I got what I needed, while getting much more than I expected. What a tremendous feeling as a paying customer. Something a lot of companies and guys are severely lacking these days. Total and complete satisfaction. And I have no doubt after speaking to you several times that you will answer any further questions or concerns I might have in the future. Another great feeling to have as a customer. I don't think I waited more than as few hours if that, and in some cases minutes for a response back from you. If you ever want to use any of this for a testimonial by all means. And I will be recommending your product and you personally to all of my prospecting peers. 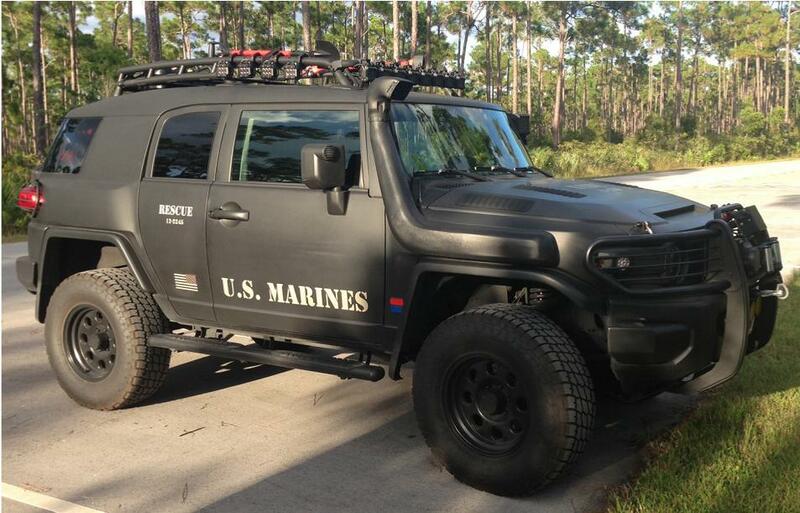 Now this is a prospectors dream vehicle!